Fourteen Boston residents gathered alongside the Boston City Council’s Committee on Government Operations to voice their thoughts and ideas Tuesday evening on an ordinance regarding the right to free petition. 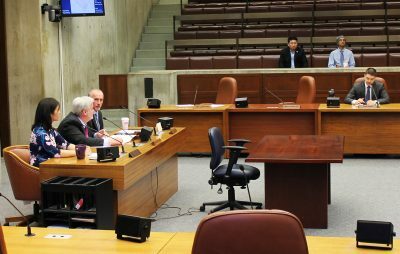 City Councilor Michael Flaherty explained during the meeting that the ordinance allows a Boston resident to petition individually, or receive at least 250 signatures, for a petition addressed to the city council. If the petition has more than 250 signatures, the city council will then hold a public hearing no later than three months from the date the petition is filed, Flaherty said. City Council President Michelle Wu sponsored the petition and opened the meeting by addressing the significance of the issue. Boston City Clerk Maureen Feeney raised concerns during the hearing about the transparency of this ordinance and suggested every step in the petition process should be recorded and documented with time stamps along the way. “We want to make sure that everything is checked and vetted,” Feeney said. Feeney also proposed to designate an area where all these records would be stored. “I think that as we go forward, we should present the best piece of legislation and continue to work on it,” Feeney said. The council also raised collective concerns about overburdening the city clerk’s office with an abundance of petition requests. City Councilor Ayanna Pressley noted the signature requirement that must be met before the city council calls a meeting to discuss the petition and questioned if a non-citizen should be allowed to sign a petition. City Councilor Josh Zakim said all citizens should be included in the right to petition. City Councilor Tito Jackson concluded the hearing by thanking Wu for sponsoring the ordinance and his constituency for bringing the ordinance forward. Palma McLaughlin, a legislative action specialist at the League of Women Voters Massachusetts, an organization that advocates for women’s involvement in government, said before the event that an active, informed and involved populous is necessary for government to work. “It only makes sense for the city to … embrace what is what we see at the lowest levels, which are the town meetings, and the highest level is the state legislature,” McLaughlin said. Several Boston residents spoke during public testimony in support of the ordinance. The free petition ordinance is a big win for the city, Jamal Crawford, 46, of Roxbury, said during public testimony. Jacob Leidolf, 27, of Jamaica Plain, said during public testimony that he is a Boston Public Schools teacher and supports the ordinance because it would open up the city’s political process to everyone. “Young people are mystified by how all this all works and [getting involved] as early as possible is important,” Leidolf said. John Curtis Jones, 73, of Jamaica Plain, said during his testimony that this ordinance could promote discussion and political awareness in the community.